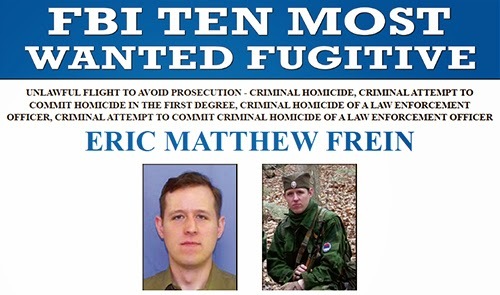 Edward J. Hanko, special agent in charge of the FBI’s Philadelphia Division, and Frank Noonan, commissioner of the Pennsylvania State Police, announced today the addition of Eric Matthew Frein to the FBI’s Ten Most Wanted Fugitives list. Frein is wanted in connection with the homicide and attempted homicide of two Pennsylvania State Police troopers. On September 12, 2014, a gunman targeted the Pennsylvania State Police Blooming Grove Barracks in Pike County, Pennsylvania, ambushing Corporal Bryon Dickson and Trooper Alex Douglass. Corporal Dickson, 38, was fatally shot and Trooper Douglass, 31, critically wounded. Days later, Frein’s vehicle was found partially submerged in a nearby pond and allegedly contained evidence linking him to the shootings. State arrest warrants were issued after Frein was charged with homicide, homicide of a law enforcement officer, and attempted murder. Frein is also charged federally with unlawful flight to avoid prosecution. He is considered armed and extremely dangerous. Frein is a 31-year-old white male (date of birth May 3, 1983), 6’1” tall, 165 pounds, with brown hair and blue eyes. He may have shaved his head on both sides and may have long hair on top. He is known to be a heavy smoker, a weapons enthusiast, and a survivalist and has studied the Russian and Serbian languages. Frein has connections to the mid-Atlantic region of the U.S., including the states of Pennsylvania, New Jersey, and New York. Eric Frein is the 503rd person to be placed on the FBI’s Ten Most Wanted Fugitives list, replacing former fugitive Jose Manuel Garcia Guevara. The list was established in March 1950; since then, 472 fugitives have been apprehended or located, 156 of them as a result of citizen cooperation. The FBI is offering a reward of up to $100,000 for information leading directly to the arrest of Eric Matthew Frein. Tips can be called in to the Pennsylvania State Police at (866) 326-7256 or to the nearest FBI field office. Additional information regarding Eric Frein, including his wanted poster, is available on the FBI’s Internet home page at http://www.fbi.gov and at the Pennsylvania State Police Internet home page at www.psp.pa.gov.